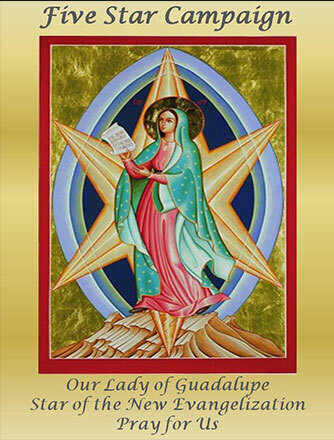 We welcome you to the webpage of Our Lady of the Lake Huron Ohio Chapter of Magnificat. 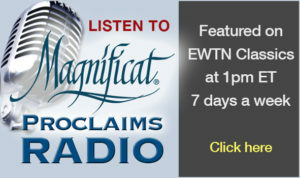 These are exciting times that we live in and Magnificat was begun in 1981 for such a time as this. There are now over 100 chapters throughout the United States and its territories and in many foreign countries. Doors open at 9 am. We do not assign seats so arrive early. 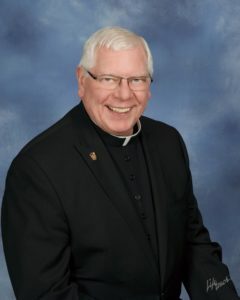 Father Jim Brown is the pastor of St. Joseph Parish in Marblehead and spiritual director of the Ministry to Catholic Charismatic Renewal in the Toledo Diocese. He first started thinking about becoming a priest when he was in the sixth grade and serving at Mass. His pastor at the time affirmed him, but he sees his vocation as a gift from God that was mediated through his parents, family, and teachers and supported by prayer. As he looks back, he can see the hand of God at work in his life – much like the poem, “Footprints,” in which only one set of footprints appears in the sand for parts of a person’s journey because God is carrying him. Father Brown currently is in his second term at St. Joseph in Marblehead, where he served from 1995 to 2007, and was asked to return in 2015. Born in Toledo, he grew up in Sacred Heart Parish, which is now part of Epiphany of the Lord Parish on the east side. He has three sisters and a brother, and lost his youngest sister last year to ALS, or Lou Gehrig’s Disease. Father Brown attended Central Catholic High School in Toledo before entering the seminary for college and theology studies. He was ordained on May 27, 1972, and was an associate pastor for seven years before being named a pastor. In all, he has served seven parishes. During his first year after ordination, Father Brown became involved in the Teens Encounter Christ (TEC) program and then in the Cursillo movement. He also became familiar with the charismatic renewal movement, but remained on the periphery until his exposure to the Fraternity of Priests and the Steubenville Conferences led him into a deeper level of involvement. Father Brown says he is looking forward to sharing more with us on April 13. Plan on being with us to hear the rest of his story. The breakfast will begin at 9:30 a.m. and end at 12:30 p.m. at Anjulina’s Catering, 2270 Hayes Ave., Fremont. To register, send $18 to Hortensia Clevenger, 316 Wexford Dr., Huron, OH 44839. Reservations must be received by April 5, 2019. Checks should be made payable to “Magnificat.” There is no registration at the door. We do not assign seats so arrive early to check in at the Reservation Table and find seat(s) before the program begins. Prayer teams and opportunities to receive the sacrament of reconciliation will be available following the meal. CD’s of the speaker’s talk will be available at the meal. Since the day is designed to speak to the hearts of women, free of distractions, it is respectfully requested that young children not be in attendance. Tickets are $18 and must be purchased in advance to secure your reservation. No tickets will be sold at the door. Your check will serve as your receipt. Please use this form for Mail-In Reservations ONLY. Complete the form below (include the names and phone numbers of other ticket holders in your group). Reservations MUST be received by April 5. Late individual reservations are $23. $18 per person by mail or $23 after April 5, 2019. Registration Form must be received by April 5, 2019. Remember our chapter’s commitment to Eucharistic Adoration and to pray the Rosary on the 17th of each month for the intentions of Magnificat, Sanctity of Life, Marriage and Family, and World Peace. the newly initiated Magnificat Internet Prayer Ministry. Contact Jane Leimeister at jane22431@aol.com. which prays with individuals following The Magnificat Breakfast. Contact Lori Mihalek at huronmagnificat@aol.com. Huron Women’s Prayer & Scripture Meeting, meets at 7 pm Mondays at St. Peter Parish, Huron. Contact Diane Dudenhoefer at 419-602-0627. Norwalk St. Paul’s Prayer Group, meets at 7 pm Mondays at St. Paul’s Parish, Norwalk. Contact Bev Reichert at 419-706-0464. Fremont Sacred Heart Prayer Group, meets at 7:30 pm on the fourth Tuesday of each month at Sacred Heart Parish, Fremont. Contact Judy Good at 419-334-8145. Emmaus Community Prayer Group, meets at 7 pm Wednesdays in chapel of St. Jerome Parish Life Center in Walbridge. Contact David Bland at 419-322-8282. Marblehead St. Joseph Prayer Group, meets at 9:30 am on the first and third Thursdays of each month at St. Joseph Parish, Marblehead. Contact Joan Dubbert at 419-734-5650. Fremont St. Joseph Hispanic Prayer Group, meets at 7:30 pm Saturdays at St. Joseph Parish, Fremont. Information about other charismatic prayer groups in the Toledo Diocese can be found here. 2020 Women’s Winter Retreat, Jan. 10-12, Our Lady of the Pines Retreat Center, Fremont, O. Presenter: Fr. Dave Pivonka, TOR, of The Ministry of the Wild Goose. Click here for details. For more information about Magnificat, contact Diane Dudenhoefer at 419-602-0627. To be added to our Mailing List, send an email to huronmagnificat@aol.com or call Diane Dudenhoefer at 419-602-0627. CLICK HERE to visit our Chapter’s website. CLICK HERE to visit our Chapter’s Facebook page. The Huron Chapter of Magnificat, also known as Our Lady of the Lake Chapter, was founded in 2006 to serve women in the northern part of the Toledo Catholic Diocese. We currently meet quarterly in Fremont, O., for a breakfast, praise and worship, prayer, and a talk by a woman who tells how God has worked in her life. At our Magnificat meals, we try to provide something for each woman to take home with her by offering a packet of spiritual reading at each place setting. Our chapter grew out of a prayer group that had gathered weekly in Huron, O., for more than 30 years. We decided to form a chapter of Magnificat as we realized the need to share our love of Jesus Christ with more Catholic women. At our first Magnificat meal on February 3, 2007, Donna Jones of Detroit shared the story of how she and her husband, Alex, a former Pentecostal minister, came into the Catholic Church. Since then, we have had heard many other stories of faith from some remarkable women. We record each of the talks and make CDs of them, including the most recent, available for purchase. In addition to gathering quarterly for the Magnificat meal, we also host an annual retreat each January and seek to promote opportunities for spiritual growth in and around the diocese.